Do you have questions about the various technologies? We will be happy to advise you free of charge about air humidification in your building. 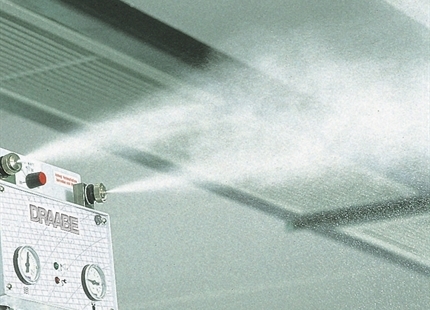 Different systems and technologies are applied in practical applications to ensure adequate humidity: Nozzle atomisers, steam humidifiers, ultrasonic atomisers and evaporators are often used as functional principles and utilised in central air humidification systems as well as in direct room humidification. 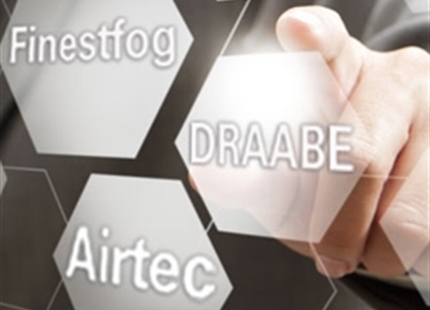 DRAABE has specialised in direct air humidification and mostly uses nozzle systems with high-pressure and compressed air technology. 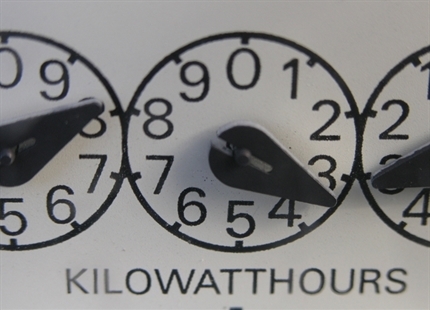 The various systems differ in terms of energy consumption, maintenance costs and humidification capacity. In nozzle air humidification systems a distinction must be made between high-pressure and compressed air nozzle atomisers. During high-pressure nozzle air humidification water is pressurised (85 bar) with a high-pressure pump. Water is transported directly to the humidifiers via high-pressure hoses (one-substance-process). It is then atomised with special high-pressure nozzles, micro-fine and virtually silent. Furthermore, high-pressure nozzle atomisers consist of a control unit and require water treatment. 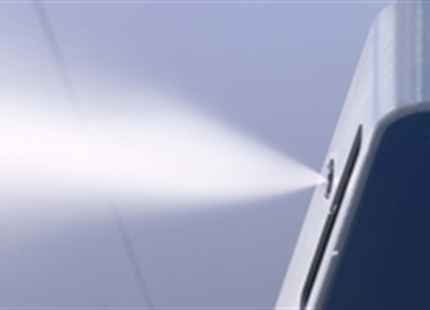 This extremely fine atomisation of the water ensures fast moisture absorption in the air. Plus, the operation is virtually silent. Humidification capacities of up to 54 kg/h (per humidifier) are possible. 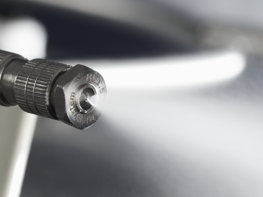 Humidification performance can be controlled quickly and easily by switching the nozzles on and off. In comparison to compressed air nozzles, this system offers far greater humidification capacity of the humidifiers (max. 54 kg/h per unit) and generates only a fraction of the energy costs. In these nozzle systems the water is being atomised with compressed air. 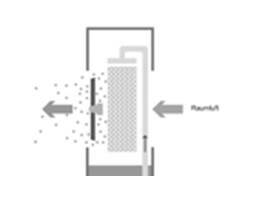 Compressed air and water are fed into the humidifier separately (two-substance-process). This long-established technology is economical, especially for smaller production areas (up to approx. 4000 m3) and is suitable for applications with lower requirements on droplet size and operating noise. This technology has proven itself for decades and is in use in a variety of industries around the world. Its simple installation makes reduced setup costs possible. Expansions are easily possible because of its rather simple installation. Evaporators produce steam in a temperature stable plastic or stainless steel cylinder, where humidifier water is heated to 100°C. Steam humidifiers are divided into three types: Electron beam, resistance and gas evaporators. The heating in the frequently used electrodes and resistance evaporators is done with electrical energy, which is why the electrical power consumption is very high. Evaluation: The steam humidifiers operate with low-noise, but have high energy consumption. Steam cylinders have a limited service life because of lime deposits. During ultrasonic humidification the water is excited to high-frequency oscillations by piezoelectric crystal elements, which makes water escape in the form of a cold fog. 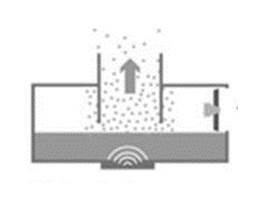 The resulting aerosol is transported into the room by normal air flow. Evaluation: Benefits of the ultrasonic humidifier include its low energy consumption, as well as its noiseless, drip-free operation. The ultrasonic oscillator has a limited service life – appropriate planning should be made for replacement parts. Demineralised water is required for operation. In the case of evaporators, the humidifying water is distributed on a contact body, or the contact body is saturated, to create a large surface for the evaporation process. A fan pushes the room air through the contact body. 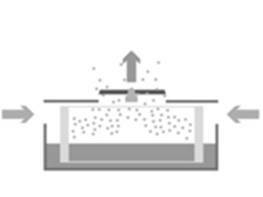 The humidification process takes place by evaporation on the surface of the contact body. Fixed devices are connected to the water supply. The contact body may be fixed or rotating. 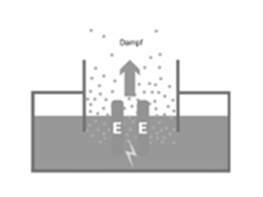 Evaluation: Evaporators have only moderate electrical energy requirements. Regular cleaning and maintenance work must be carried out to prevent the build-up of limescale and the formation of a biofilm. The water should be changed every day. On the basis of VDI 6022 Sheet 6 the use of small portable devices is not allowed at the workplace for precautionary reasons, unless the user can provide comprehensible proof of risk-free operation. Even decorative water powered devices (such as water walls, fountains) may bear hidden risks of stressing the respiratory system through contaminated water, unless they are properly supplied, cleaned and maintained. Special inspection and measures are therefore required for risk-free operation. In comparing the various humidification systems, we need to look at the operating costs, the technical equipment and also the service offerings carefully and in detail. In the interest of a high level of health protection and comprehensive operating safety, systems with integrated water treatment and a sustainable maintenance concept are preferable. One very important decision point in the selection of a suitable air humidification system is the VDI certificate. The user of a system certified in this way does have the security of operating a low-maintenance, economical and hygienic system. 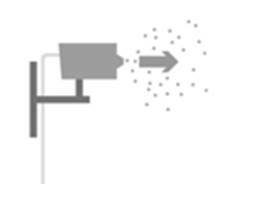 Robust and proven air humidification, ideal for small and mid-sized industrial applications.